A plant that has a non-woody stem by true scientific definition is called an herb. Most herbs are annuals, which means that you have to replant them each year. The plant or its extracts have been used for alternative medicine. Any part of the plant, like the roots, berries, leaves, flowers, bark, seeds, and so on which offer healing or nourishment to the human body can be used. Very important Micro nutrients are contained in herbs. The herb offers the body the essential nutrients along with trace elements and many minerals to keep the body in balance. This aids in overall health. Herbs can even be more helpful in this area as more information becomes available. Growing your herbs is special because you use what you grow. To use the full benefit that nature has to offer try-growing herbs organically. Growing your own herbs is very simple. Herb gardens were used for health and medicinal purposes even in ancient cultures. Yes, even these cultures grew herb gardens. Two such cultures were the Romans and Egyptians. A number of their records for herbal remedies have been found. As history goes, herbs for health in this country are a fairly recent discovery. When used for medicinal purposes, herbs take longer to react but are easier and safer on the body. The more the various herbs are discovered in even remote areas of the world the more we learn about these herbs. Ancient writings are still being found today too that point to how these herbs were used in the past and how we should use them today. They are a much softer remedy for what ails you compared to stronger, harsher medicines. These herbs are also a very effective way to nourish your body. We are finding out more and more what bad effects strong chemicals have on the human body. As we discover this more of us than ever are turning to herbs. Many times you can use the herbs along with your medication, until your system becomes repaired enough, to go off totally of the drugs you have been taking. You should never go off a medication without checking with your doctor first though. There could be special instructions on how to go off the medication. Also before just arbitrarily starting to use herbs, you need to talk to a professional on how much of what to take. Herbs taken in wrong quantities could lead to problems. Just because they are natural it does not mean you need to know what you are doing with them. They must be used correctly if you want the desired results. Herbs are nature’s medicine and when used correctly cure what ails us. Another benefit is the added nutrients to our meals. If you have any interest on how herbs can help you, investigate this subject a little further. Maybe with a little luck and research you might not have to depend on harsh medicines to solve your ills. Learn more about Herbal Gardening. 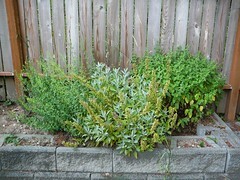 Stop by Jefferson Haynesworth’s site where you can find out all about Fresh Herb Gardening and what it can do for you.